Pidi kozhukattai (பிடி கொழுக்கட்டை) or uppuma kozhukattai (உப்புமா கொழுக்கட்டை) is a traditional preparation and is children's all time favorite tiffin item. As kids, we would relish this delicacy during our visits to grandparents’ place. The name is derived from the fact that ‘kozhukattai’ (கொழுக்கட்டை) or rice dumpling is made with the handful (பிடி) of cooked broken rice. Though it is made with broken rice like ‘rice uppuma’ (அரிசி உப்புமா), double cooking makes it soft and very tasty. Pidi kozhukattai is best served with coconut chutney or brinjal/eggplant kothsu (கத்தரிக்காய் கொத்சு). Method: Grind the pepper corns and red chilli coarsely using the mortar and pestle. Keep aside. Heat oil in the kadai, add mustard seeds and when they start to sputter, add Bengal gram dhal and urad dhal. Fry till the dhals turn golden brown. Pour 3 tumblers (600ml) of water into the kadai. Add ginger, asafoetida, ground pepper- red chilli mixture, chopped green chilli and required salt to the water, and bring it boil. Add grated coconut and curry leaves. Mix well. Reduce the flame, and add the broken rice slowly to the boiling mixture stirring continuously. Cover and cook on a low flame, stirring every now and then, till the water is fully absorbed and broken rice is cooked (Fig.1). Switch off the fire. Allow it to cool. Dust your hands with rice flour. 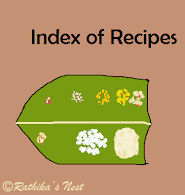 Take a handful of cooked broken rice, and shape it into oblong dumpling or kozhukattai (Fig.2). In the same manner, use up the cooked broken rice to make kozhukttais. This quantity of ingredients makes approximately 20 dumplings. Smear the idly moulds with sesame oil, and place dumplings on the moulds as shown in the picture (Fig.3). Steam the dumplings in a pressure cooker or idly cooker for 5-10 minutes. Switch off the fire. Remove the idly mould from the cooker and allow it to cool. Transfer the dumplings or kozhukattai to a hot case. Serve hot with chutney or brinjal/eggplant kothsu. Note: You may buy broken rice or rice rava available in the market. However, I prefer to prepare rice rava at home. Wash and soak 1 tumbler of raw rice in sufficient water for 4-5 hours. Drain fully. Spread it on a clean cloth and allow it to dry in shade overnight. Next morning, break the rice coarsely in a dry grinder. You need not sieve the finely powdered flour from the rava while preparing pidi kizhukattai. Small quantities of finely ground flour makes the rava more sticky and you will find it easy to make the kozhukattai or dumplings. You may pound 1 teaspoon of toor dhal (optional) coarsely using the mortar and pestle, and add this to the prepared rice rava. You may now proceed with the recipe.